Unbeatable Squirrel Girl is one of my all-time favorite comic books. It is, hands down, the funniest comic I have ever read. I’m working to buy all of the trade paperbacks so that I have the whole collection on my graphic novel shelf for future reading! Writer Ryan North and artist Erica Henderson, along with their colorist, letterer and the rest, are a crack creative team! And to honor Henderson bowing out of the series, I wanted to get together my favorite moments and jokes so far! Funny story. I met Erica Henderson once at Boston Comic-Con about two years ago. She was at her booth and I was on the prowl for a guest cover artist for the Gamer Girl & Vixen graphic novel. In my foolish bravery, I asked her if she did that sort of thing on commission. She looked at me like I was trying to sell her on a pyramid scheme and politely suggested I use the convention to find some local talent. I felt quite silly. She was so right. Here’s hoping she has even more great success on her next projects! 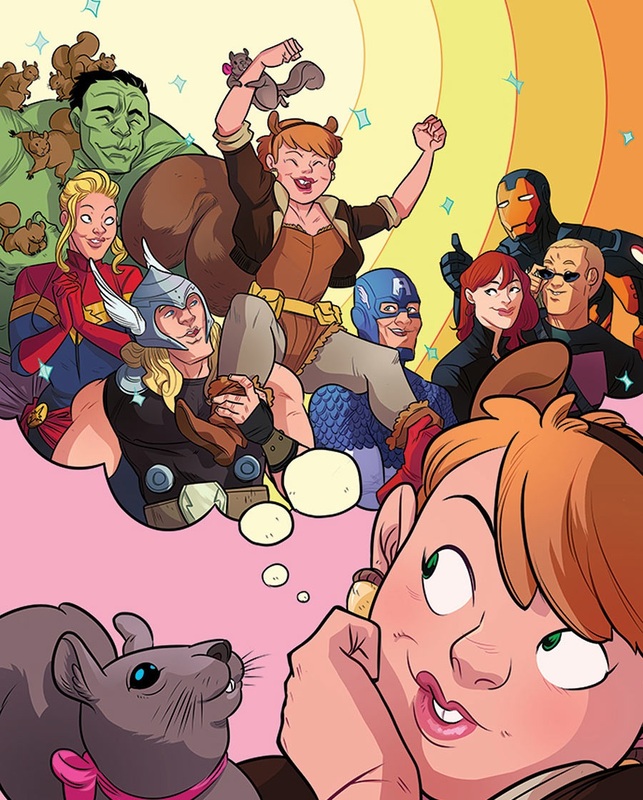 Join me after the jump for my favorite bits from Unbeatable Squirrel Girl! And yes, I realize that my taking the time to explain the jokes kind of ruins them…so perhaps just read the comic pages I post and that will suffice! 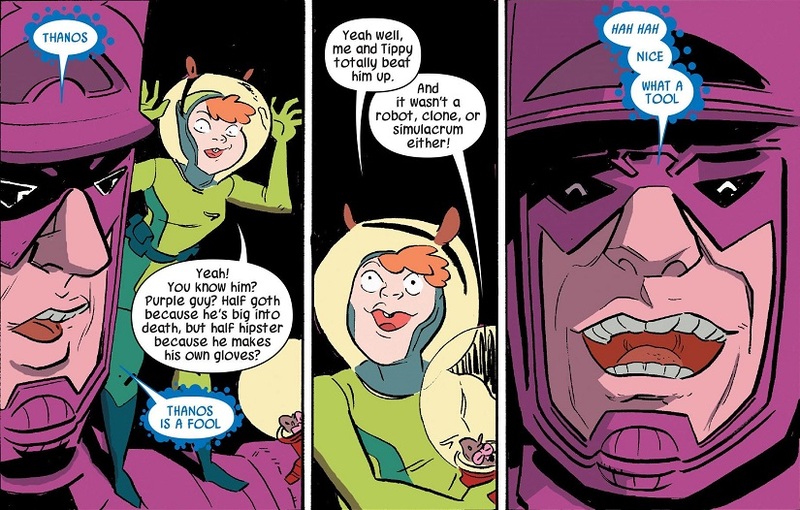 The very first panels in Unbeatable Squirrel Girl #1 kick off the series in grand style! 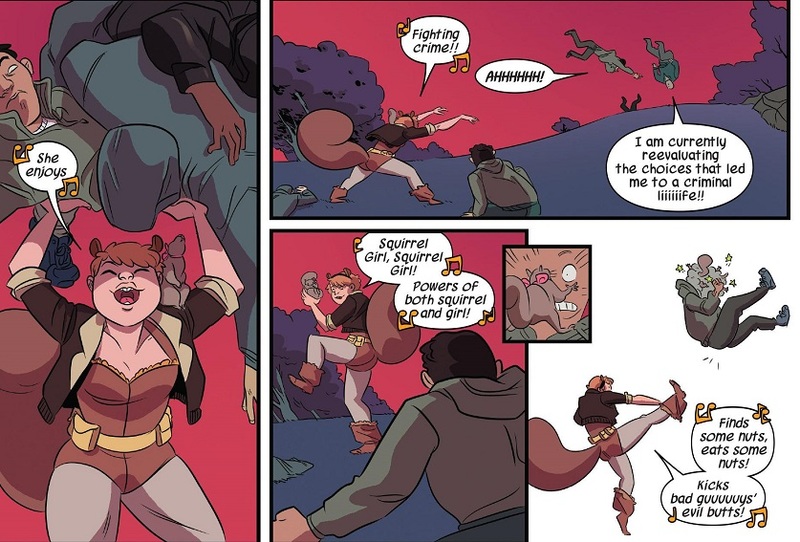 Squirrel Girl introduces herself by singing her own version of the classic Spider-Man theme song. And she does so while foiling a mugging. It’s super funny, the song lyrics are great, and the little asides by the muggers are funny, too! It was a great introduction to the character and the comic, letting us know right off the bat just how funny and silly Unbeatable Squirrel Girl would be. 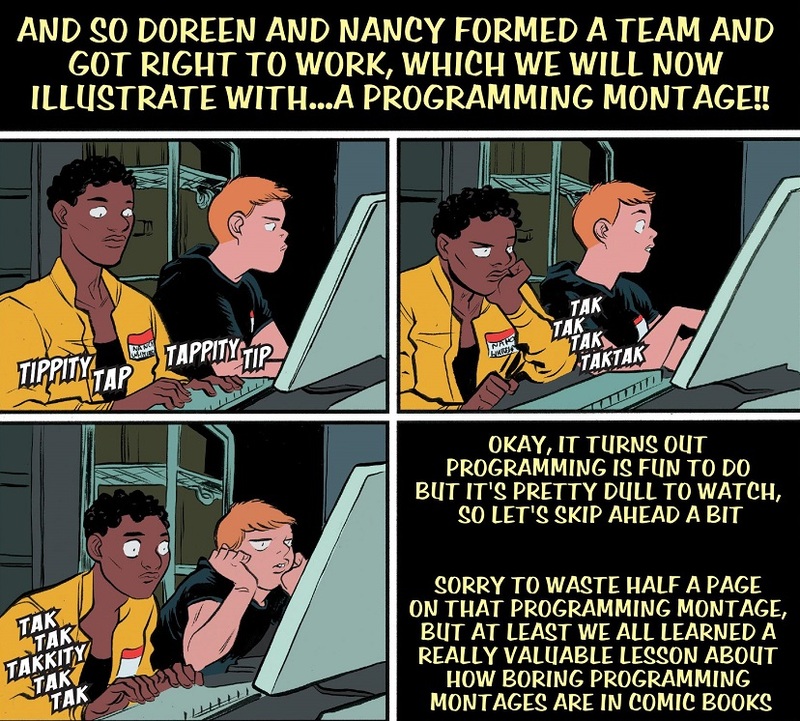 One really neat aspect of Unbeatable Squirrel Girl is that Doreen Green and her friends are all computer science students, and North really digs in deep to computer science. I’ve never been a whiz with computers, so a lot of this stuff goes over my head. But North has an uncanny ability to make coding and computer math fun and easy to understand! 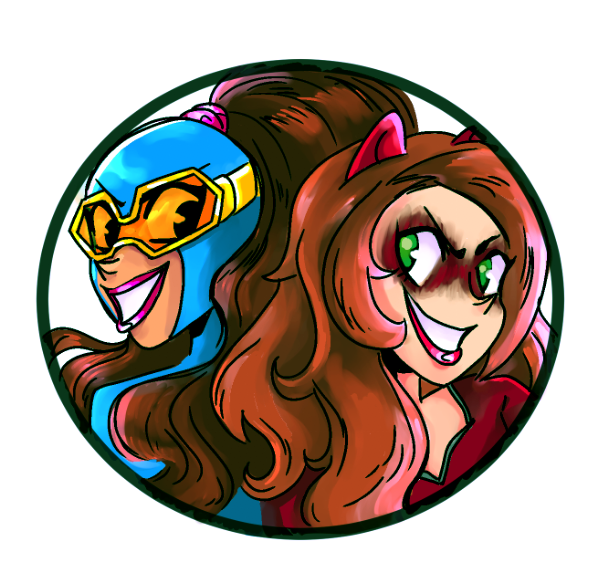 One of the best instances was when Doreen and her best pal Nancy Whitehead were summoned to the Savage Land to help revive the computers at the visitor center, leading to the above coding montage! The subsequent fight with a robotic T-Rex Ultron was also fun, but for my money, the silly coding montage was just too good. Tragedy is a robot programmed to know love! The tragic love story of Sentinel #X-42903-22 is the punchline of a two-page spread of Doreen going on various quickie dates. Nancy helps her get into online dating, and Doreen goes through a bunch of quick dates with a bunch of jerks, each one 3-panels long, ending with Doreen shuffling away and kicking a can. Then, as you can see, the final date is with Sentinel #X-42903-22. Doreen has an entirely valid reason for dumping Sentinel #X-42903-22, but man oh man, that is one bummed Sentinel. I can’t post the entire sequence here, because it goes across multiple issues and pages. But basically, the series sets up a dramatic showdown between Galactus and Squirrel Girl! How can she possibly defeat him? Then the next issue has a single page: Squirrel Girl sitting on top of a defeated Galactus, commenting on how easy that was. Cue the letters page and the end of the comic. Of course, that’s not really the end of the comic, and is instead one of the best fake outs of all time! 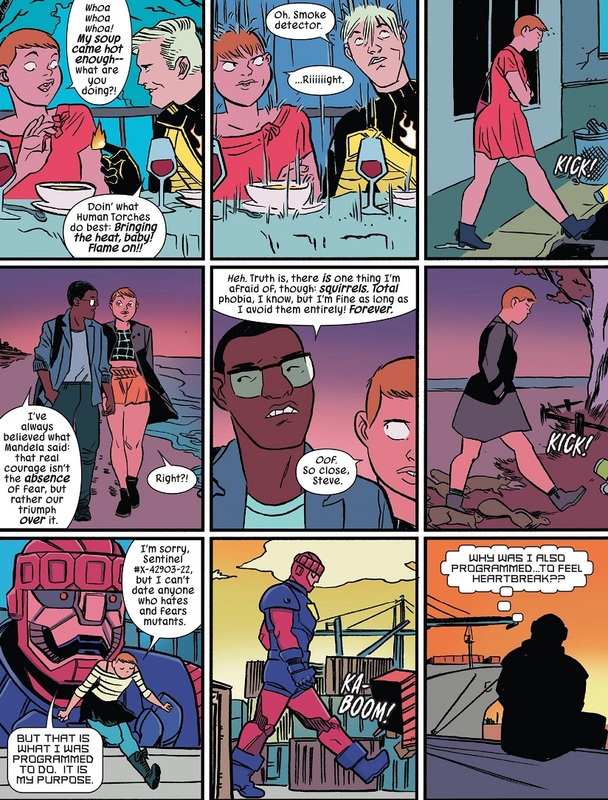 The rest of the comic picks up after the letters page to explain that Squirrel Girl didn’t beat up Galactus. Instead, she worked with him to find a peaceful solution to his problem, and the two of them became pals! Gossipy pals, like all that talk about Thanos. It’s great! This also kicked off the best theme of the entirety of Unbeatable Squirrel Girl: that Doreen Green is all about non-violent solutions to regular superhero problems. I could have picked several moments like this, like when she helps Hippo and suggests he get a job instead of robbing banks. Then there was the whole thing with the giant insects. It’s the best running theme in all of comics! 2. Learning weird hand math! This was the absolute best. So cool! I’m slightly disappointed that Erica Henderson didn’t get to draw this one. But basically, North fills an issue with a couple of short stories, because Squirrel Girl faces off against Nightmare and Venom. 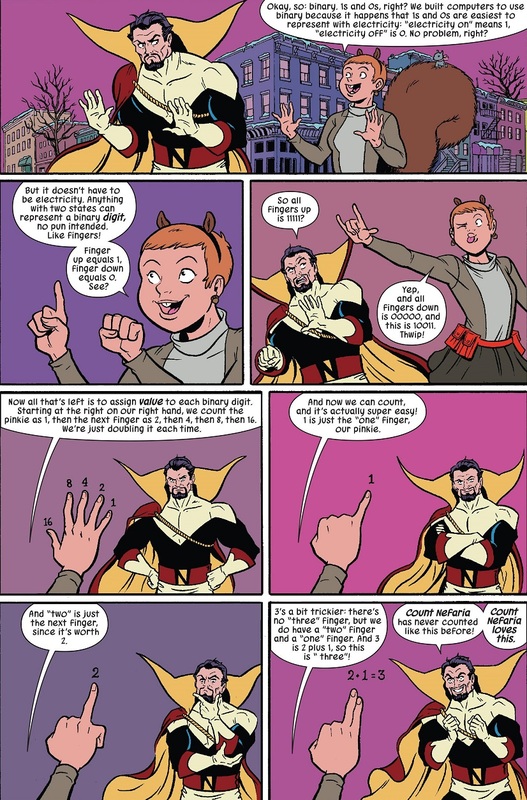 And in one of the stories, she defeats Count Nefaria by teaching him a fascinating new way of counting on his hands! This is a legit lesson about counting in binary on your fingers. It’s insanely cool and nerdy! 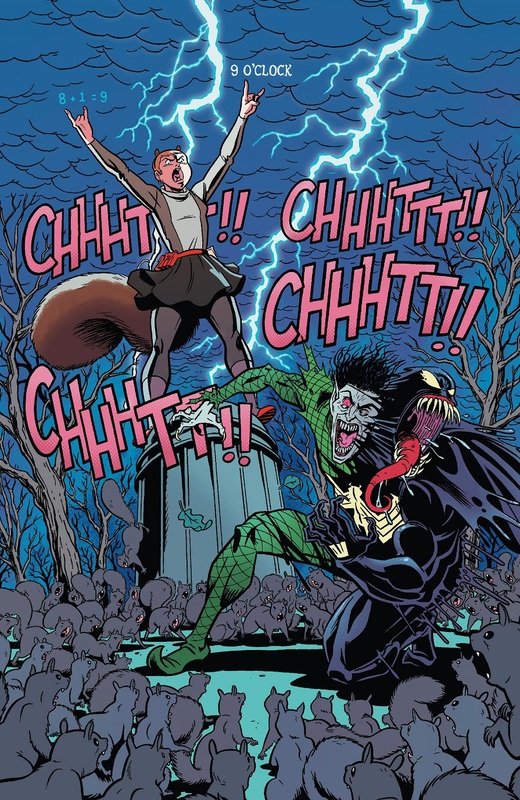 And then Squirrel Girl goes on to use the counting technique to silently command an army of squirrel to take on the bad guys. This is about as metal as comic books get. 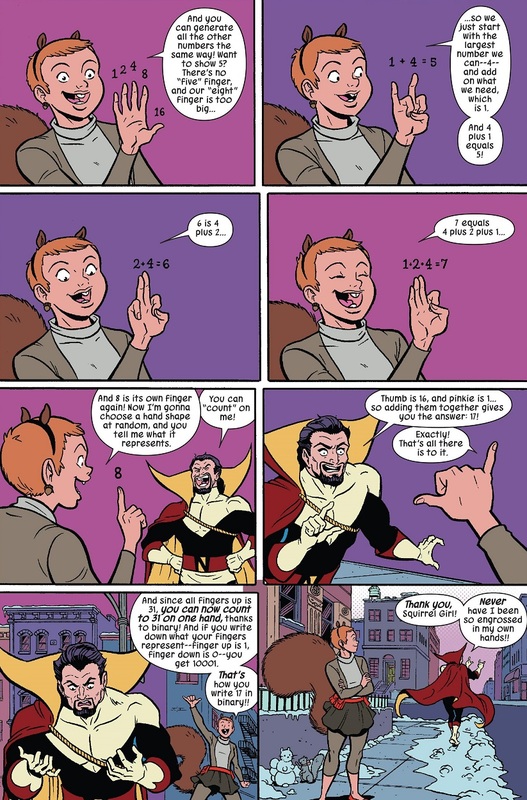 And it’s about Squirrel Girl teaching the reader about a fun new counting method! Awesome and informative! The coolness of that new counting technique is trumped only by the funniest gag in all of comicdom. 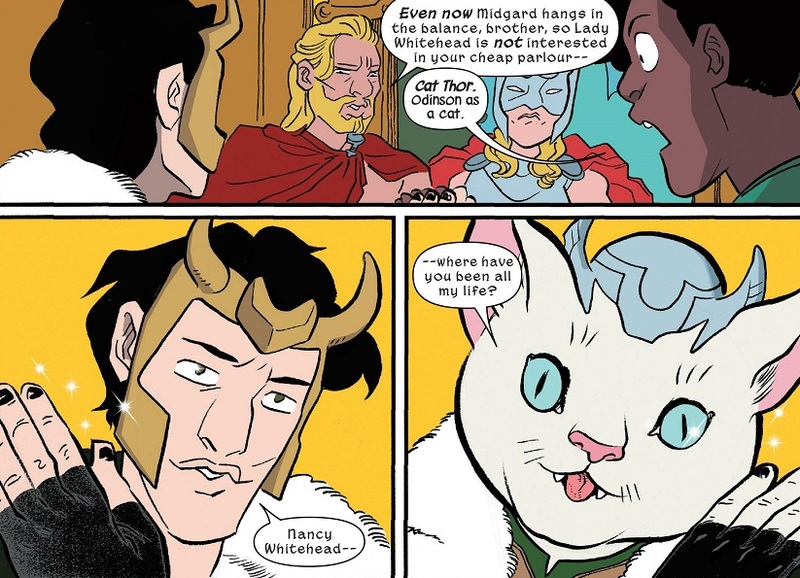 Nancy Whitehead, Squirrel Girl’s best friend, writes and draws her own comics about Thor as a cat. So when she meets the actual Loki and he offers to do an impression of her favorite celebrity, Nancy does not hesitate. Neither does Loki. Here they are in an incredibly serious adventure, with the whole world at stake, but Loki spends the whole scene with a silly cat head. And Henderson draws the hell out of it! 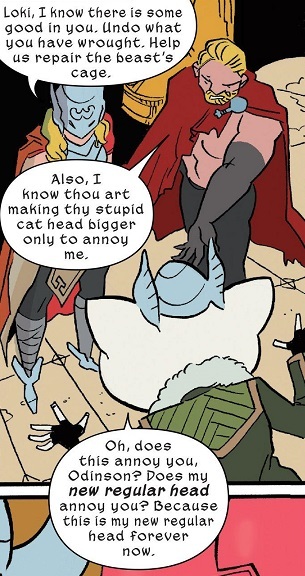 This is, in my opinion, the single funniest moment in the entirety of Unbeatable Squirrel Girl so far. And possibly the funniest thing I’ve ever read in a comic book. I am more than open to the idea of North and his new art team changing that opinion in the future. And so many great moments ended up on the cutting room floor to make this list. Maybe I’ll do another one down the line! Posted on April 18, 2018, in Comics, Lists of Six!, Marvel and tagged Erica Henderson, Ryan North, Squirrel Girl, Unbeatable Squirrel Girl. Bookmark the permalink. 1 Comment. I’m working my way through USG and it’s quickly becoming my favorite comic series ever. So funny, so clever, so good at undermining comic tropes and gender norms.